Love and trust Jarrow Formulas. Very good quality Coconut Oil. 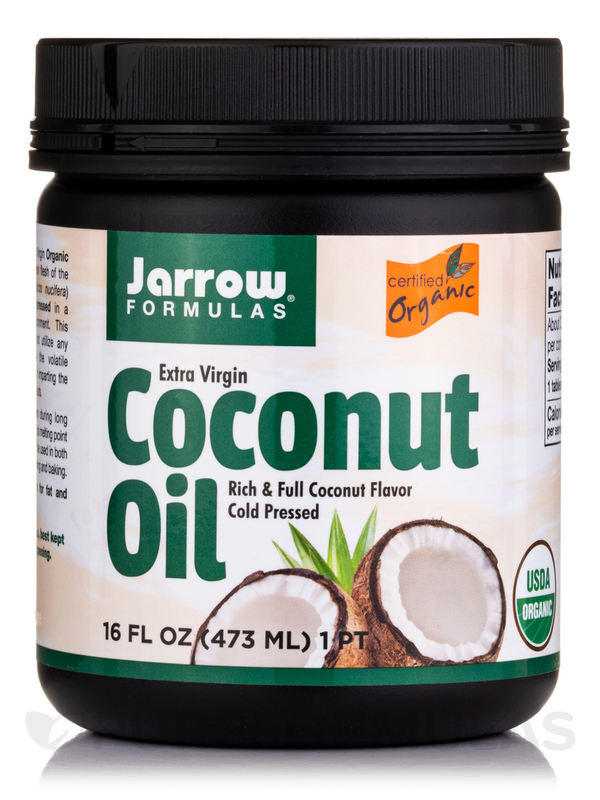 Coconut Oil (Extra Virgin) by Jarrow Formulas is a wonderful product, great for skin & hair. Coconut Oil (Extra Virgin) from Jarrow Formulas® may boost metabolism and support a healthy immune response. Coconut oil from the flesh of coconuts‚ Cocos nucifera‚ has been used in Ayurvedic practices for over 4‚000 years. It is lower in calories than most oils and this supplement from Jarrow Formulas® brings to you an unrefined extra virgin version with all its health benefits. Extra virgin coconut oil is stable‚ healthy‚ and naturally free from trans-fatty acids. Coconut oil has a melting point of 75-76° F and can be used in either liquid or solid forms for cooking and baking. The coconut oil present here provides medium-chain fatty acids (MCTs) including lauric acid‚ caprylic acid‚ and capric acid‚ which are quickly converted to energy by the body. When compared to long-chain triglycerides (LCTs)‚ which are present in other cooking oil like vegetable and canola‚ MCTs are healthier and may not get stored as fat. Lauric acid and caprylic acid present in the supplement may also support a healthy immune response by maintaining a healthy environment where the cells can thrive. Coconut Oil (Extra Virgin) from Jarrow Formulas® is suitable for vegetarians and vegans‚ contains tree nuts (coconuts) and is free of wheat‚ gluten‚ soybeans‚ dairy‚ eggs‚ fish/shellfish‚ and peanuts. Not a significant source of Vitamin D‚ Calcium‚ Iron or Potassium. Ingredient: 100% unrefined cold pressed‚ organic‚ extra virgin coconut oil. No wheat‚ gluten‚ soybeans‚ dairy‚ egg‚ fish/shellfish‚ or peanuts. Vegan / Vegetarian / Certified Organic. Use as directed by a healthcare practitioner. For maximum freshness‚ best kept refrigerated after opening. Allergen Caution: Contains: Tree Nuts (Coconut). I love Coconut Oil by Jarrow Formulas it's slightly expensive comparing to the regular one but worth every penny as it's more pure. I like everything about Coconut Oil. So far there is nothing I dislike about Coconut Oil. Coconut Oil by Jarrow Formulas is way better than the other version of this brand I have both but this one is better. Fast shipping and Coconut Oil by Jarrow Formulas is exactly what I wanted! Couldn't be happier! Love the taste and quality of Jarrows Coconut Oil the best. Also very important to me that it is listed as gluten free on the label. Will definitely keep buying. I love Jarrows brand Coconut Oil. I recently ordered Coconut Oil made by Pureformulas for my Mom who is suffering from early dementia. Coconut Oil was shipped free and arrived at her door 2 days after I placed the order. We were amazed. Mom finds this particular brand tastier and is using more of it because of that. It remains to be seen if it will actually stall the dementia but we are hoping! Would definitely order Coconut Oil again! I purchased Coconut Oil from the health food store initially and found in small print on the label that it "may contain peanuts and soy" which is not good for people with food allergies. I purchased Jarrow Formulas Coconut Oil. It is free from allergies and it is a really good product to use for cooking etc.